Charles L. Jones, FIDSA | Intuitive Surgical, Inc. In 2016, Charles Jones, FIDSA, joined Intuitive Surgical, Inc. as senior vice president and CDO, design and user experience. He leads the company’s efforts to blend technology with enhanced, human-centered design thinking—while driving a consistent design experience for Intuitive products and services. Intuitive Surgical is a global technology leader in minimally invasive robotic-assisted surgery. Its da Vinci® Surgical System enables surgeons to operate minimally invasively through a few small incisions from an ergonomic console—enabling surgeons to operate with enhanced vision, precision and control. Today, a da Vinci procedure occurs every 60 seconds somewhere in the world. Most recently, Jones served as the first chief design and technology officer for Newell Rubbermaid. 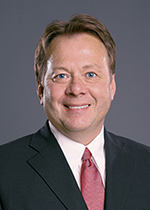 Previously, he held several key leadership roles at Whirlpool Corp., Xerox Corp. and Herman Miller. He's received more than 100 international design awards—including the prestigious Cooper Hewitt, Smithsonian Design Museum National Design Award—and holds more than 50 patents. Jones led an IDSA International Design Excellence Awards (IDEA) and a Design of the Decade jury. He is an honors graduate of Purdue University, with degrees in industrial design and human factors engineering, and he completed an executive program at Cornell University. He was inducted into the IDSA Academy of Fellows in 2001, and belongs to Design Management Institute; Corporate Design Foundation; and Human Factors and Ergonomics Society. Jones is an internationally recognized design leader who effectively manages multi-disciplinary creative organizations specializing in the linkage of brand, design and business. He has authored academic publications surrounding the field of cognitive psychology, human engineering and product strategy. Jones has been a guest speaker at Ohio State University; Cornell University; University of Rochester School of Business; Purdue University School of Business Administration and School of Engineering; and the Kellogg Business School at Northwestern University—covering brand, design, innovation and product development. Jones also has been the subject of more than 100 magazine and syndicated newspaper articles in publications such as Businessweek, Fast Company, The Wall Street Journal and The New York Times. In 2004, Jones was named a Fellow with the World Technology Network in recognition of his accomplishments in linking brand and design strategies, resulting in positive business impact. A year later, Jones was named a Master of Design by Fast Company. He was a contributing editor on Creating Breakthrough Products and featured in a chapter in The Design of Things to Come.